Raspberry vinaigrette is delicious on a tossed green salad. Try making this creamy version for tonight's meal. 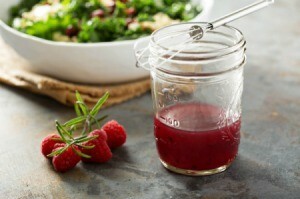 This guide contains a raspberry vinaigrette recipe. Vinaigrettes are a healthier alternative to creamy salad dressings. You can make your own raspberry vinaigrette with this simple recipe. In a small saucepan, cook vinegar and sugar over low heat until sugar is dissolved. Pour in a jar with a tight fitting lid. Add remaining ingredients. Cool for a little while. Cover and shake well. Chill. Shake before using over your favorite salad.